Wailea Elua Village offers tropical vacation condos set amid Wailea’s resort hotels, making it a perfect luxury destination. Enjoy easy access from this vacation condo at Wailea Elua Village to the restaurants and spas of the Wailea resorts via the picturesque Wailea Beach. From Elua 1201 you can stroll to breakfast, lunch or dinner to some of the best dining spots on the island. The Wailea Coastal Walking Path will lead you there. Enjoy one of Wailea’s spectacular sunsets as you venture out to listen to fine music, sip some of the world’s best wines, a local beer, or an exotic drink. Try out the spa at the Four Seasons, and shop for something new to wear…a magical piece of jewelry perhaps. If you journey to the end of the path you will experience the cliffs of Wailea Point, and pass through a Native Hawaiian Coastal Garden, with the sound of waves below, hitting the cliffs of black lava rock. 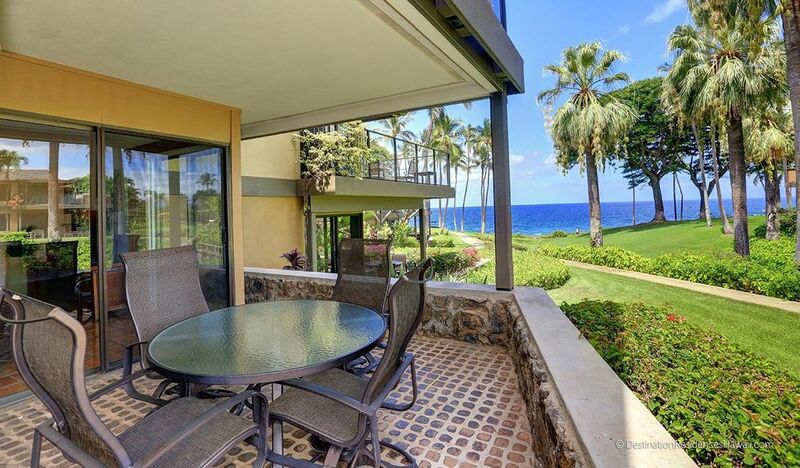 You may choose to prepare your own feast, and dine on your private lanai. See the world anew through an ever-changing living watercolor that is the Wailea sky. From Elua 1201 you can count on glorious Wailea weather year round. The rest of Maui is accessible from this ideal location. From La Perouse Bay, just minutes away, with its indescribable terrain, resulting from the last lava flow on Maui in 1790, through 11 climate zones (there are only 13 in the world) to the summit of Haleakala at 10,023 feet, where a sunrise is a profound experience. This is where the legendary demigod Maui performed two of his greatest feats; battling the son god and lifting the sky. Take one of the worlds most scenic drives through Maui’s rainforest to Hana , where following the example of Charles Lindberg, who lived a few miles down the Hana coast, George Harrison built his hideaway on Maui. Stop for dinner in Paia on the way back. This little town is one of the surfing capitals of the world and has a unique character. You might see a famous big wave surfer cross the road, or a movie star having dinner at his favorite restaurant in the world: Flatbread. People come to Maui for its exquisite beaches, sunsets, waterfalls, whales, and some of the best surfing in the world. Others come for exceptional golf, tennis, snorkeling and scuba diving. Hawaii is the most remote major island group on Earth, it is 2400 miles from the nearest continent, formed from volcanoes in the Pacific Ocean, making it rich in history, geology and marine life. This is a lovely unit right down by the ocean. I always like tile floors Carpets never seem clean. The bathroom was beautifully remodeled. The kitchen had a nice face-lift. If it had been truly a remodel I would have given it five stars. We have stayed in units with a completely remodeled kitchen, so I can compare it. But this was very nice. The artwork on the walls was exceptional. Usually there are cheesy Hawaiian prints for artwork. This unit has some beautiful artwork by a local artist, Margaret Bedell, who passed away a few years ago. I'd actually love to buy some of her pieces for my home. Stunning. The only semi-negative is this unit is on the main path down to the beach. So early in the morning and throughout the day there is lots of foot traffic and some noise. But after 10PM quiet time you can lie in bed and hear the ocean waves. Thank you! We enjoyed you being our guest and look forward to welcoming you back soon! This one bedroom ground floor condo is very well situated within the Elua complex, with a beautiful view of Ulua beach. The living area, Kitchen and bedroom were very nice. We rented 3 condo's during our stay (family vacation), and we will be back.